I was very surprised to learn the great gap that exists between knowledge/ evidence/research and practice. One would by default expect that research findings will lead to improved care. The nurse is a very important member of the healthcare team. The nurse is involved in helping patients/clients in several ways all aimed at improving health and quality of life. The nurse has a pivotal role at both managing diseases and conditions and educating for prevention purposes. In the contemporary world, the field of nursing and medicine has greatly improved due to research findings. However, as I have learnt through this unit, it is not enough to have research findings/knowledge/evidence. This evidence should be put to practice so that it can help people live better and health care lives. It has long been known that it requires dedication and will to change habits or behaviours. This implies that the process of ensuring that knowledge is translated to practice is not an easy one. There is hope, however, because it can be done. Psychologists stipulate that behaviours can potentially be unlearnt and replaced by new ones. It is not any different with the nursing profession. Since the government is the primary care provider to the citizens, it should set up measures in place to ensure that the research findings are integrated in the modern care. The government and other organizations/individuals/groups spend a lot of money on research. It would be sad if the research findings were to be of little or no use. I understand evidence-based practice to be the utilization of the scientific research findings in to the offering of care. The main goal of the research process is to increase the body of knowledge and lead to improvement in the quality of life (Graham and Tetroe, 2009). this explains why a lot of resources are used (especially by governments) to fund research. The goal is to not only answer research questions but also to translate the knowledge obtained into practice. The term has evolved since the 1980s. 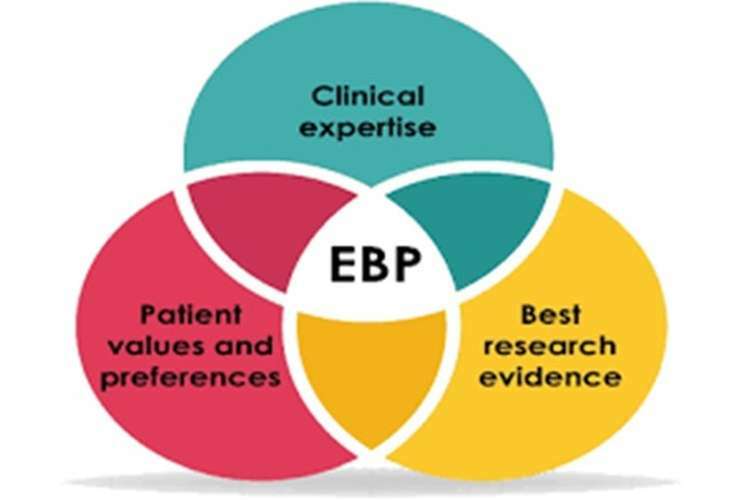 Then it was referred to as ‘evidence-based medicine.’ (Friesen, Bour., van and Beurskens, 2015) Later, the term was changed to evidence-based practice. This happened as health practitioners realized the great importance of using scientific evidence in making clinical decisions (Townsend and Morgan, 2017). The life of a patient is very important, and the goal of all health care professionals is to ensure that it is taken the maximum care of. For that to happen, it is very important that the professionals keep themselves updated with the most recent findings. This calls for dedication and will. The government has a great role to play in ensuring that evidence-based practice becomes widespread. This can be achieved through such ways as forming an institution to oversee the translation of the scientific findings into practice. In a nutshell, I understand evidence-based practice to be practice that is guided by the most recent scientific evidence. The area that I have chose to discuss is the management of obesity. Obesity has defined as condition of having excessive body weight. Numerous researches have revealed that obesity is a risk factor for many chronic diseases such as diabetes mellitus type 2, some types of cancer and cardiovascular diseases (LoBiondo and Haber, 2014). It is therefore common practice to advise the clients who are obese to reduce their weight so that the management of the conditions that they may have will improve. Some of the key issues pertaining to leadership and management of obesity and what underpins it are going to be discussed next. First, the most commonly used tool for categorizing individuals as obese or otherwise is the Body Mass Index (Dang and Dearholt, 2017). This tool is commonly used and believed by many practitioners to be an accurate determiner of BMI. However, there is great research that has revealed that the BMI tool could be misleading. What is undesired in the body is excessive fat mass. If an individual’s BMI is high because of high bone and muscle mass, then it would be wrong to classify that person as one who have unwanted/unnecessary weight. Another worse technique that is used by some health care professionals is to assume that an individual is obese or not by looking at them. This is subjective and unscientific yet common. The final aspect about obesity that I would like to address is that of dietary management. Scientific evidence suggests that a weight loss diet should be high in fibre and low in carbohydrates and fats. It also encourages regular consumption of water (at least 2 litres a day) and fruits and vegetables (4-6 servings a day). A healthy diet is highly encouraged by scientific evidence. Despite this, it is common to find practitioners to eat very little amount of foods, skip some meals, and other habits that could worsen the state of overweight/obesity. To make the matters even worse, some even encourage their patients to use fad diets. While some of these diets could lead to weight loss, they do so in a manner that compromises the health of a patient (DiCenso, Guyatt and Ciliska, 2014). This is a clear indication that despite there being extensive scientific research findings, the application degree is still low. There is still a great gap between knowledge and practice in the health care sector. As Grol and Wensing (2009) observe, it is not easy to tell how some physicians are offer care using the most recent scientific evidence while others do not. Once new knowledge has been found, there are three factors that are necessary for its assimilation into the daily lives of individuals. First one needs to acquire the knowledge. If one is not aware of anything, it goes without saying that such a person cannot practice using the knowledge. Therefore, one of the measures that could be used to make sure that knowledge translates to practice is to ensure that the knowledge is available (Kalb, O'Conner, Brockway, Rierson, and Sendelbach, 2015). This could be done through such methods as health education campaigns or even a self-initiative of keeping oneself updated with the moss recent findings. The second important factor is that the knowledge must influence the attitude of the individual (Hamer and Collinson, 2014). If this happens then the knowledge acquired can lead to the third step which is practice. If the attitude of an individual remains unchanged, then it is very unlikely that that the knowledge they have has not been translated to practice. An example would be a nurse who smokes and feeds on a lot of junk foods, yet they know that such behaviours have negative health impacts. From the observations above, it can be concluded that having knowledge does not necessarily lead to practice. There are several barriers to evidence-based practice. One is lacking innovation where the current system cannot innovate a way of welcoming the new findings. Another is individual professional who may not be willing to have the knowledge or whose conduct is not change by practice. The patient may also have problems understanding what the health care professionals say to them or they may be unwilling to comply with what they are told. In such situations, even when the medical team acts based on the evidence-based practice approach, it would be difficult to use the knowledge to intervene (Straus, Tetroe and Graham, 2009). The final reason to be discussed will be that of economic and financial services. It may be costly to carry out the research or even to assimilate the research findings in to everyday activities. If I were to change practice in my setting tomorrow, the uppermost in my mind would be ensuring that the current knowledge is routinely communicated to healthcare professionals and encouraging them to adopt the findings into offering of care. As observed earlier, the best place to start from is ensuring that the health care professionals have the knowledge. For that knowledge to lead to practice, it would be necessary to ensure that education sessions are carried out often. Where possible, the professional skills could also be motivated, say with some extra amount of cash. It has long been known that a behaviour is reinforced via rewarding, it is likely to persist (Grove, Burns, and Gray, 2014). It has also been observed that knowledge must shape the attitude for it to translate to practice. Motivation plays a key role in making the knowledge that one has influence their attitudes (Farokhzadian, Khajouei and Ahmadian, 2015). I would grade this letter as a distinction. It has employed a wide range of literature and went beyond the readings that were suggested. In addition, the work follows a logical flow and ideas are arranged in some nice sequence, each lead to the other. In addition, there is well thought, and critical analysis of the points presented. The ideas are also explained in a clear and precise way. The language is also simple yet maintains an academic tone. Great examples are provided to expound more on some of the ideas. The grammar is also appropriate, and the work follows the guidelines provided. Great academic writing skills are very important since they help a student communicate effectively to their teachers/tutors/lecturers/professors. I have always appreciated the importance of effective communication. I have therefore been endeavouring to improve my writing skills each day and I believe that this piece deserves a distinction. 1.Dang, D., & Dearholt, S. L. (2017). Johns Hopkins nursing evidence-based practice: Model and guidelines. Sigma Theta Tau. 2. DiCenso, A., Guyatt, G., & Ciliska, D. (2014). Evidence-Based Nursing-E-Book: A Guide to Clinical Practice. Elsevier Health Sciences. 3. Farokhzadian, J., Khajouei, R., & Ahmadian, L. (2015). Evaluating factors associated with implementing evidence?based practice in nursing. Journal of evaluation in clinical practice, 21(6), 1107-1113. 4. Friesen-Storms, J. H., Bours, G. J., van der Weijden, T., & Beurskens, A. J. (2015). Shared decision making in chronic care in the context of evidence-based practice in nursing. International journal of nursing studies, 52(1), 393-402. 5. Graham, I. D., & Tetroe, J. M. (2009). Getting evidence into policy and practice: perspective of a health research funder. Journal of the Canadian Academy of Child and Adolescent Psychiatry, 18(1), 46. 6. Grol, R., & Wensing, M. (2004). What drives change? Barriers to and incentives for achieving evidence-based practice. Medical Journal of Australia, 180(6 Suppl), S57. 7. Grove, S. K., Burns, N., & Gray, J. (2014). Understanding nursing research: Building an evidence-based practice. Elsevier Health Sciences. 8. Hamer, S., & Collinson, G. (2014). Achieving Evidence-Based Practice E-Book: A Handbook for Practitioners. Elsevier Health Sciences. 9. Kalb, K. A., O'Conner-Von, S. K., Brockway, C., Rierson, C. L., & Sendelbach, S. (2015). Evidence-based teaching practice in nursing education: Faculty perspectives and practices. Nursing Education Perspectives, 36(4), 212-219. 10. LoBiondo-Wood, G., & Haber, J. (2014). Nursing Research-E-Book: Methods and Critical Appraisal for Evidence-Based Practice. Elsevier Health Sciences.